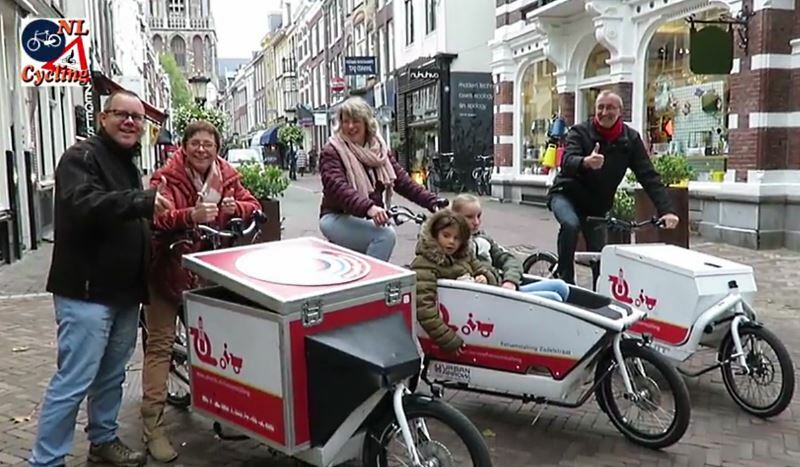 Three rental cargo bikes and a group of smiling people could be seen riding through Utrecht on a beautiful autumn day not so long ago. 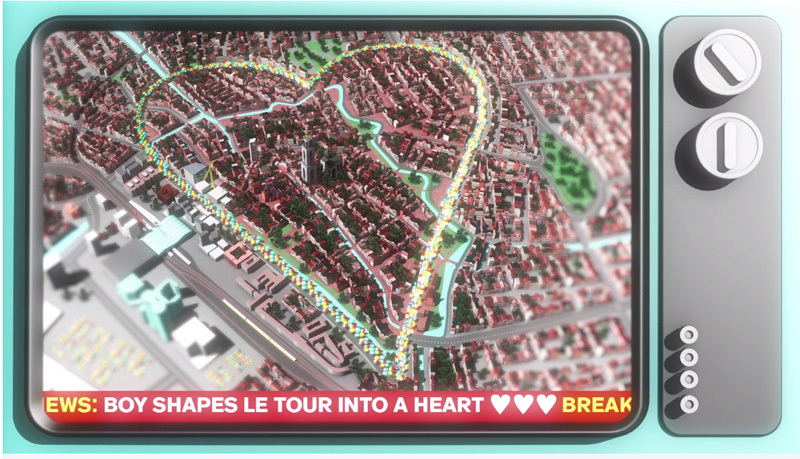 They were on a tour that had got the name “Coeur Bike Utrecht”. The tour was organized by Judith Un-van der Toorn who lives in France but who is originally from The Netherlands. Visiting her home country for the Autumn holidays with her family she organized the tour to – as she put it – “promote the transversal power of biking”. It turned out to be a fun morning. The tour started in front of the bicycle parking facility in the Zadelstraat, the street with one of the better views on Utrecht’s pride: the Dom tower. The tour had its beginning and end at one of the Utrecht bicycle parking facilities. The facility in the Zadelstraat is housed in a former store and has three cargo bikes for rent. Judith and a friend reserved all three. 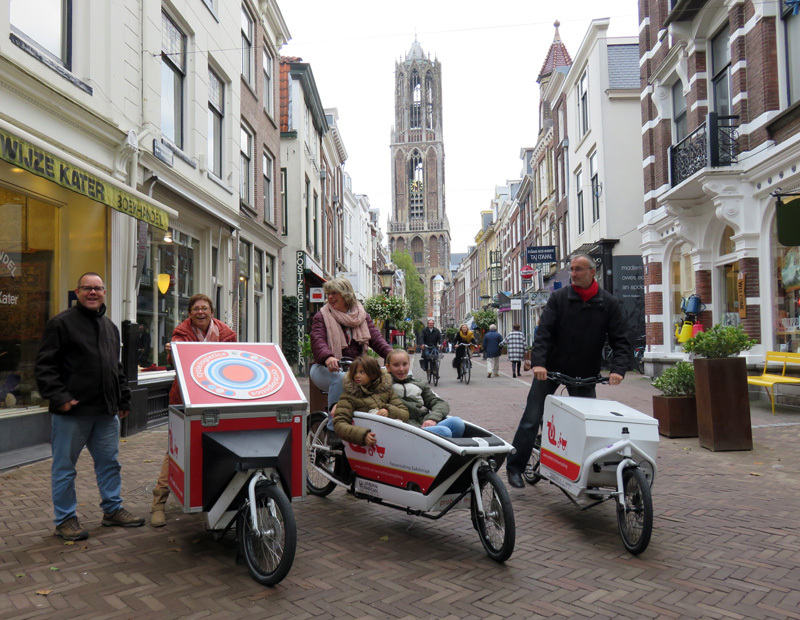 “Can you believe these cargo bikes cost only one Euro per hour to rent? One euro! And just see how much fun this group of people had for that ridiculously low amount of money.” Judith was very enthusiastic about this service in Utrecht. With the same enthusiasm she runs the organization E-Commobile conseil in her hometown of Chalon-sur-Saône in the Burgundy region in France. E-Commobile aims to provide guidance on behavioural changes towards sustainable transport. Its objective is to increase the modal share for daily bike users from 2.4% now to 10% in 2020, in large and medium-sized cities. Herbert Tiemens took a selfie on the oldest cycle path in the Netherlands, the Utrecht Maliebaan. Judith planned the route in Utrecht with the help of Herbert Tiemens who was an excellent guide on the tour as well. At several stops he drew attention to some of the infrastructure and why that was built as it was at that location. The tour also went to Miffy Square, the oldest cycle path in the Netherlands and the world’s tallest Lego tower. After a fun morning of cycling Judith and her family went back to France where she will continue to promote everyday cycling. Feel free to support “Judith du PaMA” on social media: Twitter or Facebook (mostly in French). Thumbs up for the mini cargo bike tour with three rental bikes! Very cool and useful bicycles. I doubt if we’ll ever see them here in Atlanta. I’d like to try one. Probably a little tricky with that wheel out front. I imagine the weight tends to shift in the opposite direction from the way you turn the wheel. Dear Mark, the heart of Utrecht and the heart of Burgundy and the heart of old Europe is beating for 10% daily bikers in all countries with less of this modal part. Let’s create a Care Bike Coaching pilot project in order to bring balance back. I wonder what the effects (on collision rates, and injury and death rates) are when someone cycles either stoned or drunk, or both. Or distracted with something like a phone. I don’t think the latter is illegal, and possibly not the stoned/high part. If you don’t know English idioms, stoned means the effects of cannabis. Being stoned while driving or riding is illegal in the Netherlands, at least if you’re stoned enough that you know or should know it would impair your driving. I vaguely remember that a road test (with a car, on a closed off motorway) was done on the effect of driving stoned. The conclusion, if I remember correctly, was that someone who was stoned was just about as bad at driving as someone who was drunk, but that a stoned person *realizes* he is driving badly and thus drives extra carefully to compensate whereas a drunken person has a highly inflated view of his/her own capabilities. Death ?? Not likely! Minor injuries.. sure, but how would you compare that with English drunk driving?? Things that could happen are for instance; you are half drunk/asleep and you ride into a ditch, you are happy drunk and playing with friends, your bikes collide… you have a few scrapes and a bruised elbow for a few days. This sure happens to teens in the Netherlands. In fact it is quite the opposite of what you state, texting is illegal and being intoxicated or high is not (at least it is not enforced). No one has ever gotten a fine for that. If they stop you, you are fined for either causing public disorder/nuisance or being a public drunk. Not for participating in traffic while being intoxicated. It is a given you are on your way to a party or to bed, so police don’t bother annoying you! They might just make you aware of your situation, tell you to be careful, keep your lights on and obide by traffic rules. Seriously, traffic deaths… What are you talking about. This is the Netherlands. In most cities you can count deadly accidents on a single hand and the situation is thoroughly analyzed and criticized by residents, local media, police, traffic planners etc.. Please keep your weird preconceptions about marihuana too yourself and open your eyes to reality. Agreed. I’ve never heard of a cycling death that didn’t involve motor vehicles, and that’s the point of having the infrastructure – to make it perfectly safe even for people who do something silly. We all make mistakes and shouldn’t face death as a consequence of a momentary lapse of concentration or rationality! 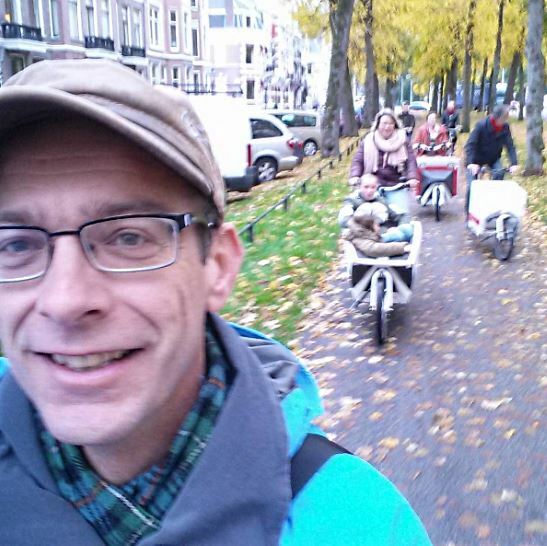 This entry was posted on 3 November 2015 by Bicycle Dutch in Original posts and tagged campaigning, cargo bike, Utrecht, watching people cycling.